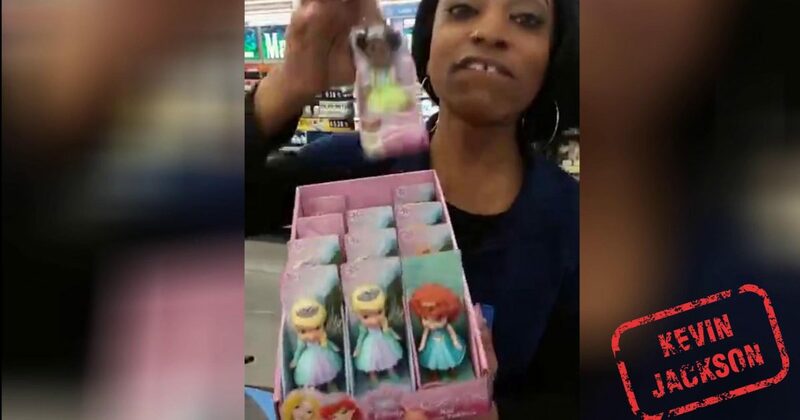 Maybe Walmart should consider raising the pay in some stores, so they don’t have to deal with race-sensitive employees. Walmart gets a lot of products from a lot of sources. I’m not sure if they have a policy on “How not to offend our black employees,” but they might consider it. Either that or raise the minimum wage, so they can attract better workers. Apparently this unknown young black militant chick, let’s call her Sheniqua X can spot racism in interesting places. Black Liberals like this chick are taught to look for nonsense like this by race pimps. And if that wasn’t enough, she’s silly enough to do this on CAMERA, on COMPANY TIME! And you wonder why there is an unemployment issue in the black community. It’s because of clowns like this. Walmart pays her to WORK, not become Sheniqua X, political pundit.